For as long as I can remember, no matter where I have traveled or where I have lived, I have been deeply curious about the way things were, particularly how the landscape looked prior to so many humans. For instance, while riding in a vehicle, I cover the roads and fences with my forearm so that all I see is a mountain, field or bare land. Or if I’m walking through a place that offers more natural elements over man made ones, I’ll move my hands together just so in order to recreate a time with fewer people or things. Think Willa Cather novel. My favorite time to ponder this is during a Michigan winter after a new, dense snow has covered everything, like in the small town where I was raised. Then and there, on a snow-packed late night on a couple of old streets lined with Victorian homes, something stirs in me that I want to hold and cherish. Through it, I imagine when the Earth wasn’t (as) piped or flattened or clogged with power lines, or perhaps was used more sparingly, was more honored, or simply had fewer inhabitants. It is nostalgic, I know. Progress has been happening for a long, long time. All humans want to make home and have Earthly, creative needs. Garnet Peak hike. East County, San Diego County. My first memory of California is a romantic one. I was young, probably six or seven years old. My family and I took a long summer road trip through the U.S.; a major destination was Southern California. We saw the San Diego Zoo, we went to Disneyland and to Hollywood, and we visited my great aunt and uncle. They had a home on top of a bluff near Escondido. It was a ranch-style dwelling filled with Midwestern furniture and, to me, ornate, antiquey things. My aunt, always sporting her black horn-rimmed glasses, had blessed the home with the magic of her green thumb; roses and plants grew everywhere, the clippings of which many of us family members still grow as our own decades later. Meanwhile, my stern uncle had surrounded the house with a farm full of avocado and citrus trees, which grew down the slope of the bluff. My first avocado was from his trees, and my first glass of freshly-squeezed orange juice, too, at least in my memory. It was a remarkably idyllic experience, especially when the sun shown from the valley below where mostly brush and foothills marked the earth. Escondido might have looked a little like this circa the late ’70s. El Cajón, San Diego County, CA. That was the late ’70s, a long time ago. A lot has changed — the people, the land, my perspective. As we rolled into Southern California, we found that we were surprised by a few things. California is mountainous country, and canyons make up many parts of the urban layout; we didn’t remember it as such. San Diego proper enjoys a lovely, moderate temperature almost all year — although it is not always sunny — but the high desert inland areas are hot. That was news to us, too. But the biggest surprise — for me at least — was what I couldn’t see: I couldn’t see the land. I couldn’t see what San Diego and much of Southern California used to be. We humans have gobbled it up. Urban sprawl at its finest. It seems as though there is barely a patch of earth that isn’t claimed all the way to the ocean, although this isn’t exactly true (much of East County is uninhabited back country). It made our journey to Southern California difficult for me/us to embrace. It beat down my dreamy nostalgia and sucker-punched my ideals of having and trespassing less. That is fine, of course, and understood as most things don’t last forever. But for this family, Southern California was full of contradictions and difficult to grasp in more ways than one. We all have used the land, more or less, and in some places it is much easier to perceive it untouched. In West Texas and Texas Hill Country, in the forests of Maine or the North Woods of Wisconsin, the Upper Peninsula of Michigan, and in Arizona and New Mexico, uninhabited ground is more facile to envision. But throughout major cities in the U.S. and elsewhere, the trail of fewer people is non-existent, virtually impossible to to comprehend anymore. San Diego is one of those places. Beautiful, fun, concrete jungle. 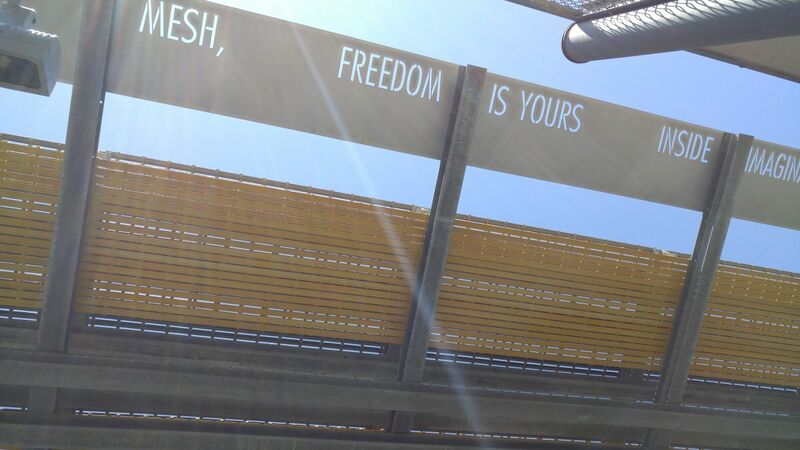 Broadway Park, San Diego. We found that we loved it and loathed it. It fooled with what we knew, it messed with our plans, it enlightened us. It was hot and beautiful, and dry and parched. The Colorado River doesn’t make it to the ocean anymore as most of it is dammed; all of the water nourishes the Southwest, especially Southern California. San Diego often seemed separate and not always equal, yet folks seem to just go with it. The food is delicious and varied and expansive. Property and housing costs a lot for a little. 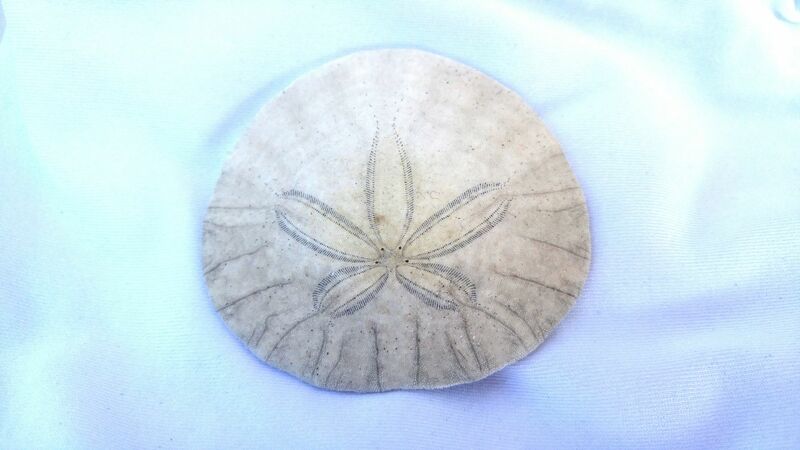 The beaches are abundant. Fires burn. People have carved out every available space possible to touch a bit of heaven here, come rain or shine, or hell or high water, because … it’s SoCal, bro! Nevertheless, we took in the dichotomous nature of greater San Diego, making our way over four long and intriguing months in the high desert at a not-campground, all the while continuing to learn more about ourselves, our family, our travels, our hopes and dreams, as well as the ideologies of SoCal people. The generalizations that are made about how people interact in the U.S., mostly via the media, are a stark cry from the reality of the communities in our country, truly. This we have experienced through our travels. San Diego — a blessed border town with an intermingled, often intrepid, busy population — is no different. So … the answer to whether or not Southern California is a place where we would want to live is no, it is not, but we liked it enough to return again here and there for a month or two at a time. Love it or hate it, San Diego can show one a thing or two about how to live life, have fun and just go for it, even if it happens in cramped spaces or in high rises, during a drought or on a budget. It is a mirror for all of us somehow, a reflection of ourselves and our culture. 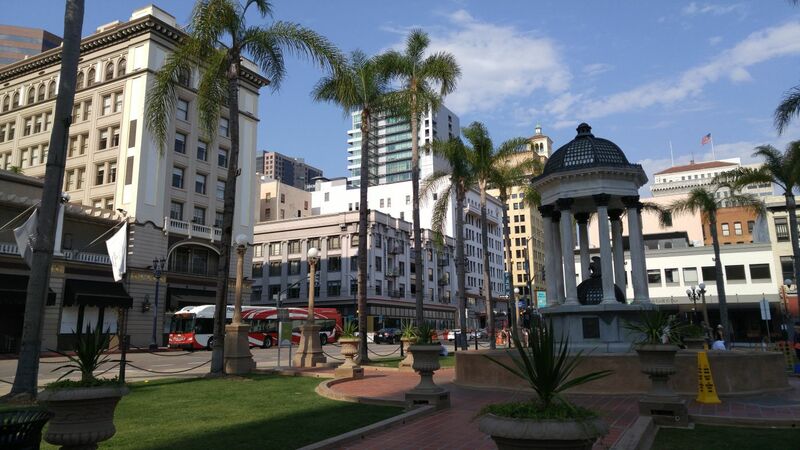 Fascinating, bustling, thirsty, rich, poor, this is our San Diego. The beaches. Of course, the beaches. We actually met some Californians who considered themselves “not beach people,” but we are, so we looked at them funny and then made every effort to frequent the beach as much as possible. There are seventy miles of San Diego coastline and an almost equal number of beaches. Some are state parks, some are communities built around beaches, some are for surfers, some are for families, some are quiet, some are rowdy. Whatever you want from your sandy experience, San Diego can deliver. Our first beach visit was to the last bastion of old school SoCal, Imperial Beach, which we made on a Friday to coincide with its farm market. Close to the border, humble and accessible, Imperial Beach was fun and easy going with lots of killer surfing, yummy food stalls and live music under the palms from the local high school band. Then we headed to Ocean Beach for another farm market beach experience as only crunchy, hippy Ocean Beach can provide. We spent a “June Gloom” day for a picnic in La Jolla, which is less beach and more deteriorating sandstone outcroppings, as well as home to its famous sea lions and pockets of tidal pools. Luna and I made it to really beautiful Mission Bay, which is more than just beach: There are calm inland bays for paddle boarding and kayaking, and there is a small amusement park should you lose your enthusiasm for sitting beachside. It reminded me of a small version of an old New Jersey beach town. 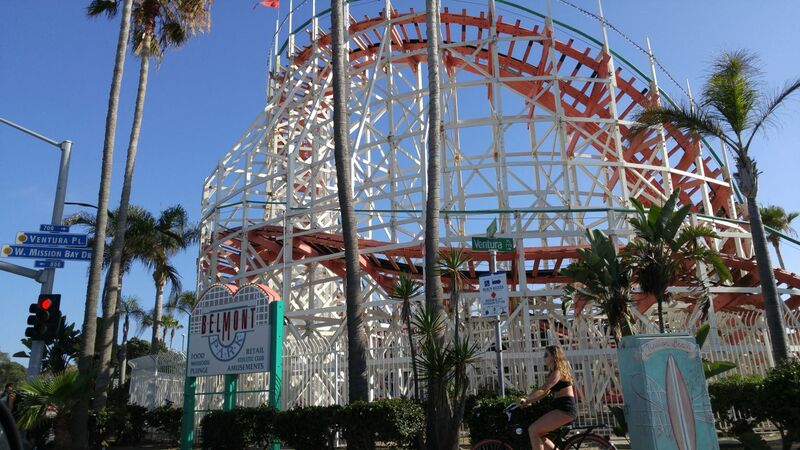 Belmont Park Amusement Park, Mission Beach, CA. 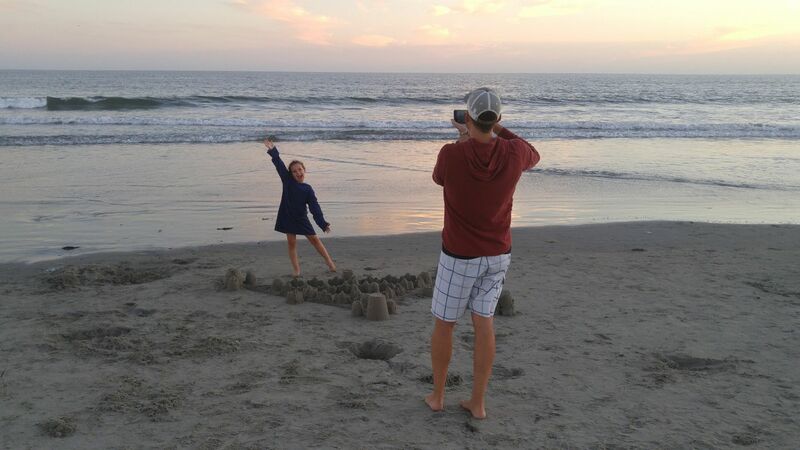 As a family we packed up for Coronado Beach just south of downtown, and San Elijo State Beach up north in Encinitas. 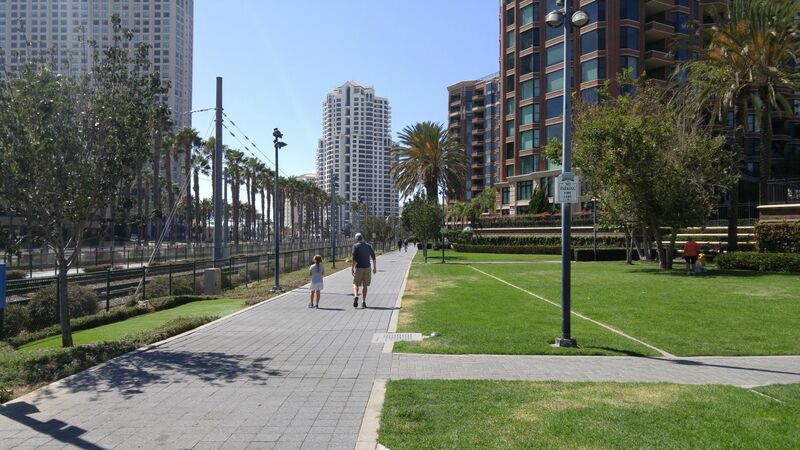 We are fond of Coronado; it is very family-friendly and the city itself is charming, albeit much, much busier these days. 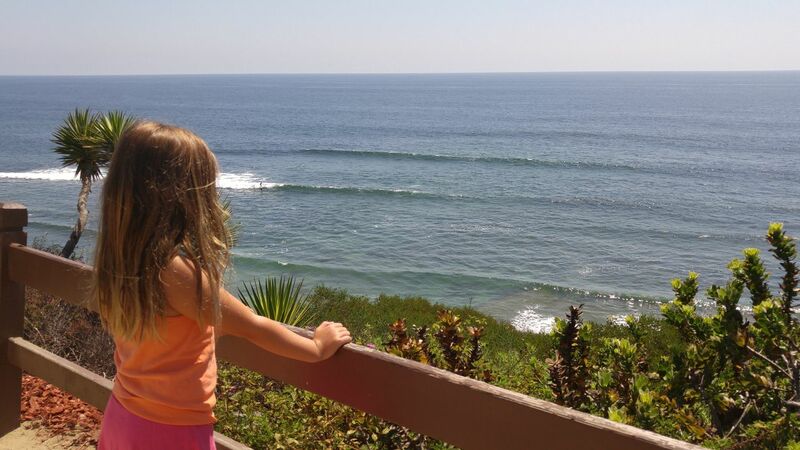 Encinitas is famous for its laid-back, old school surfer vibe at places like Swami Beach, as well as for the SRF Hermitage & Meditation Gardens established by Paramahansa Yogananda in 1938, which we made sure we visited. Castle complete! Coronado Beach, CA. 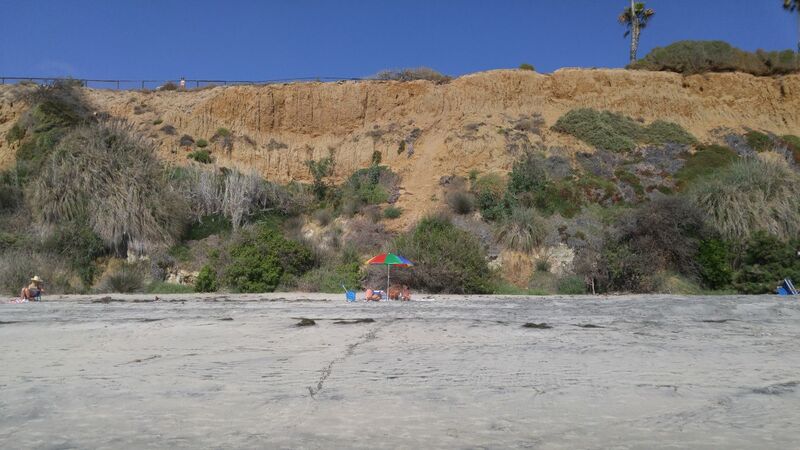 A completely different landscape at San Elijo State Beach. Encinitas, CA. Luna above San Elijo State Beach from the SRF Hermitage & Meditation Gardens. Encinitas, CA. They all have their charms. During the summer, it is nearly impossible to access a beach after 10 AM, so going on a weekday is perfect and possible for us with this untethered lifestyle of ours. Parking is mostly awful in Ocean Beach and La Jolla, but plentiful in Mission Beach and Imperial Beach. Don’t go to Coronado on a Sunday: You could spend a couple of hours stuck on the bridge trying to return home. San Elijo State Beach is very quiet but a bit of a trek to descend to the beach and climb all the way back up that mountain of a staircase. All of the beaches are worth it, though, truly. Perhaps our favorite beach experience occurred when we finally were able to camp at one for a few days and nights at Silver Strand State Beach in Coronado. Camping on or near the beach generally proved challenging and very expensive in Southern California (more on that later), but if you keep searching, a campsite will open at a state beach somewhere, sometime (except at San Elijo State Beach, which functions on a lottery and is perpetually full. Good luck.). Most of the state campgrounds are booked many, many (many) months in advance. Inexpensive, fun and open to pretty much all types of campers — especially good ol’ tenters — a state park is ideal. After many searches and hitting the refresh button on my computer practically every day, we were able to camp at Silver Strand. Silver Strand State Beach and Campground. Coronado, CA. Silver Strand was a wonderful experience because it is as close to private beach camping as a camper can get. Untouched by shoreline manicurists, it is full of sand dollars and long, full bundles of kelp. Large firepits provided lots of warmth and ambiance, and we fell asleep to the sounds of the surf. Everyone there was camping traditionally, and it was a really nice break from our SoCal not-camping experience. Downsides are that the “campground” is a parking lot, and sand and salty dampness are impossible to keep up with, so you don’t. You just chill. It is a very San Diego beach thing to do. 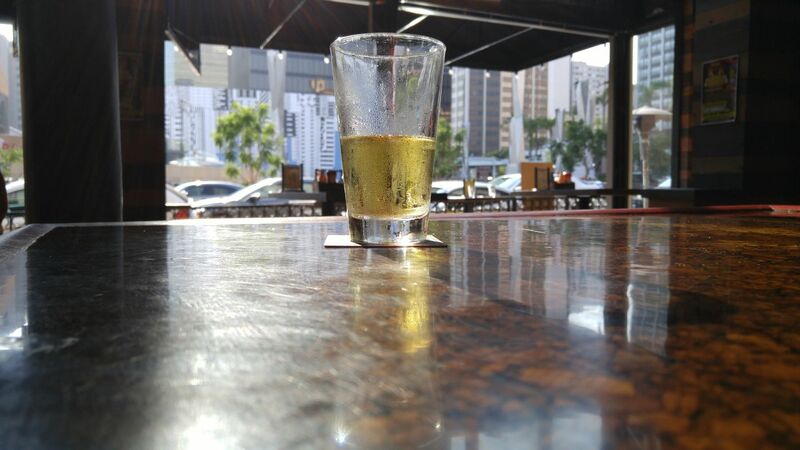 Culinary and craft beer delights. 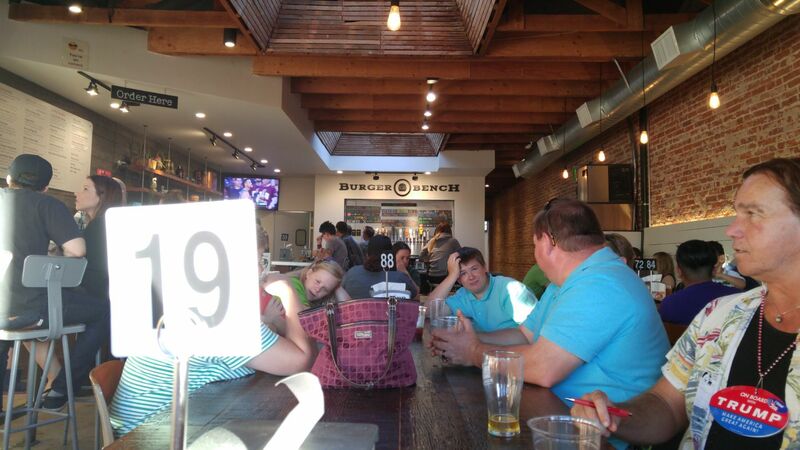 One could live a lifetime and never experience the entire food scene in San Diego. Every neighborhood, every region has something to offer, and we simply reveled in it. 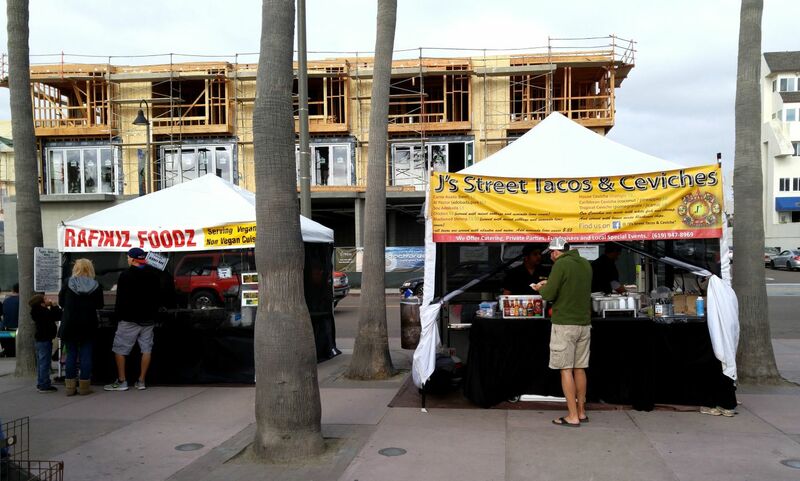 From farm market food stalls to taco shacks and doughnut shops; from unique brewery grub to elegant seafood; from ramen sit-downs to rural, high desert taverns, eating out in San Diego enabled us to engage in the plethora of communities that make up San Diego County. San Diego as is also a major craft beer hub. The creative craft beer movement here is astounding, diverse and inspiring. 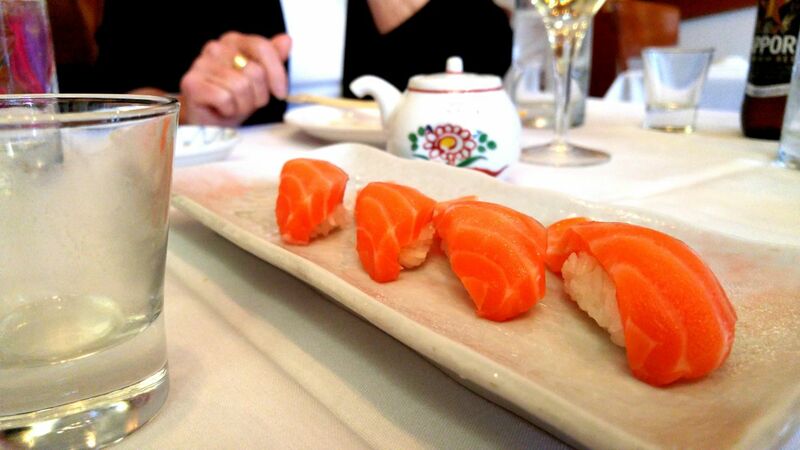 It was easy to support local, eat well and try something new all of the time during our stay. Here is a look at our palette pleasures. 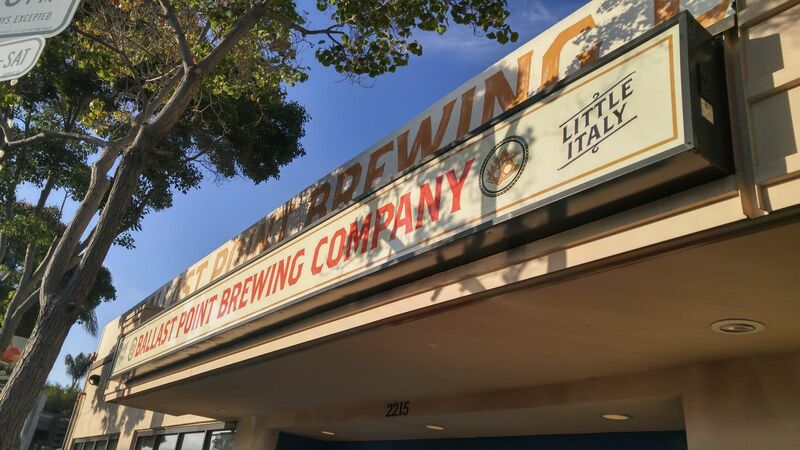 A favorite: Ballast Point Brewery in Little Italy, downtown San Diego. 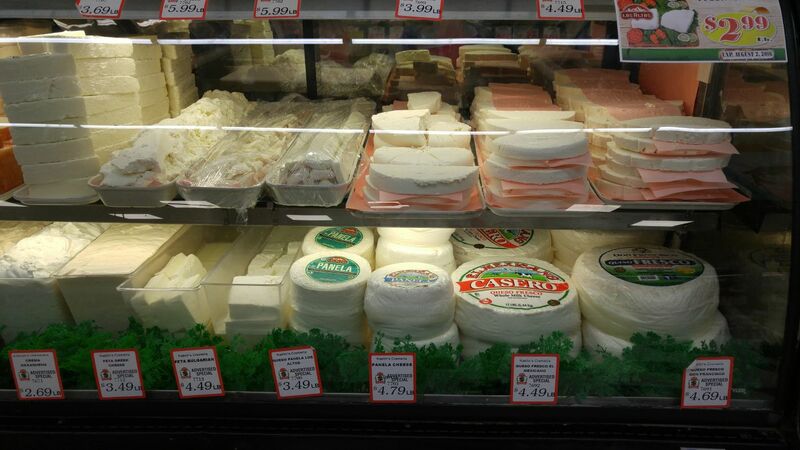 Mi Pueblo Market queso counter. El Cajón, CA. 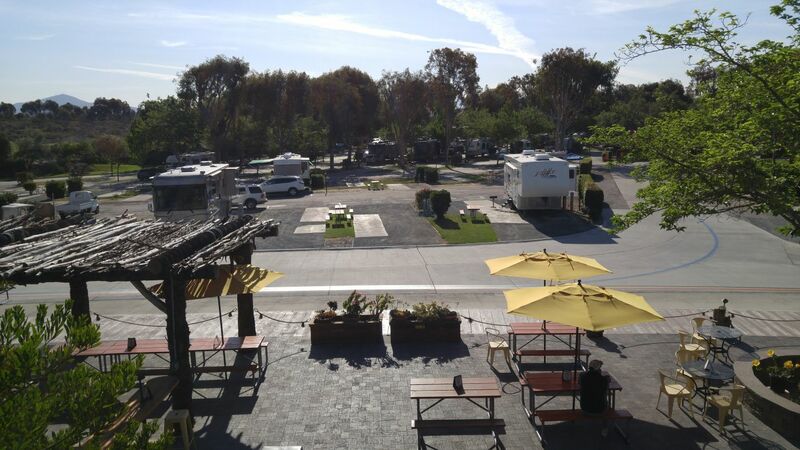 A view of Broadway Park from The Commons Bar. Gaslamp Quarter, San Diego. Taka for sushi. Gaslmap Quarter, San Diego. 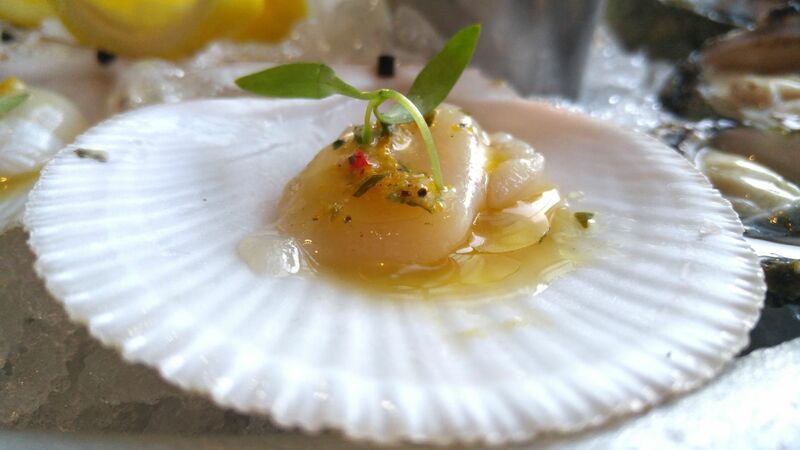 Scallops at Water Grill. Gaslamp Quarter/East Village, San Diego. 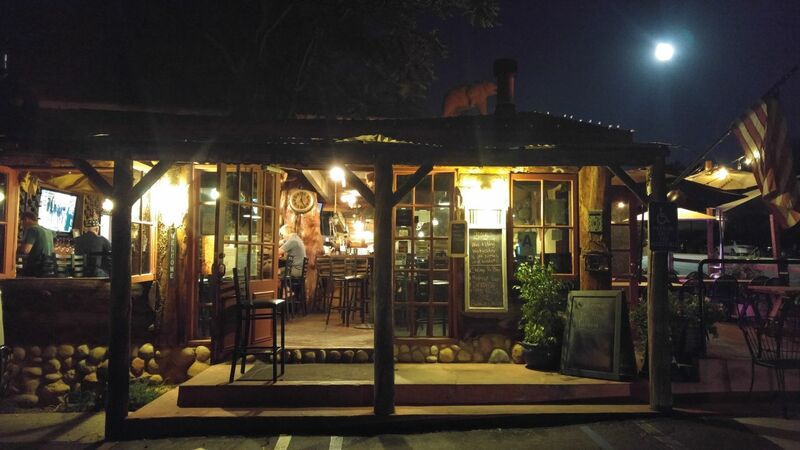 A favorite rural hangout, Alpine Tavern. Alpine, CA. Delicious. 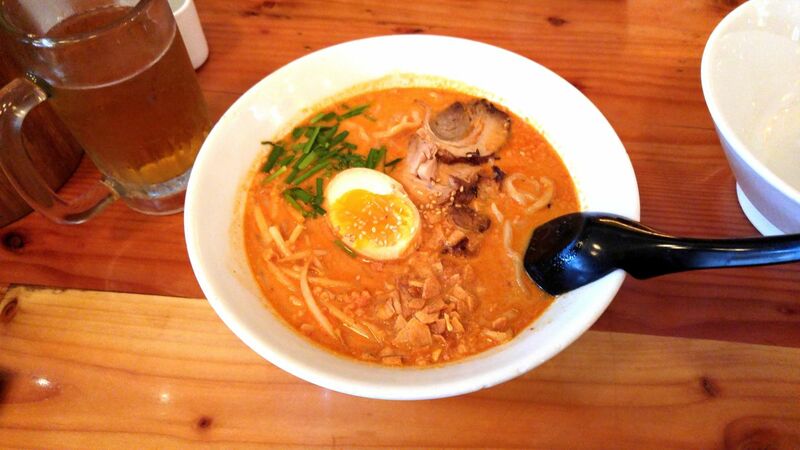 Tajim Ramen. Hillcrest Neighborhood, downtown San Diego. 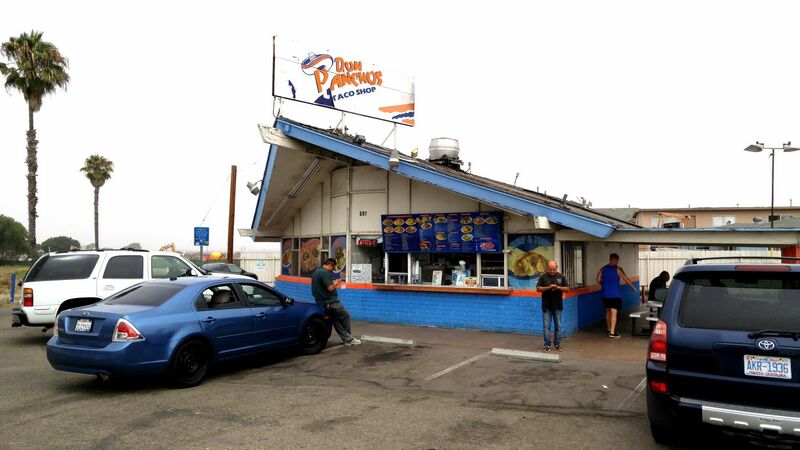 Don Panchos for taco and enchilada grab. Imperial Beach, CA. Parks, playgrounds, museums and hikes. Because of its lovely climate, San Diego County is a place with and for people on the move. There are endless possibilities of fun here. 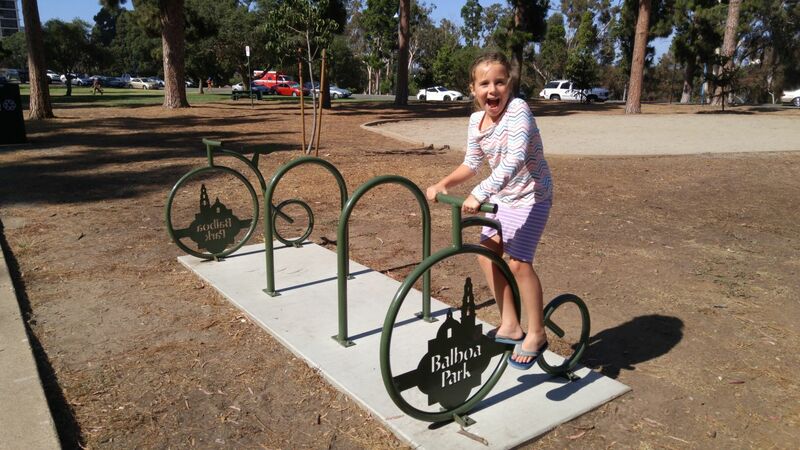 Among our favorite places to play were all things Balboa Park, especially the playground, the San Diego Zoo and the gardens; the art museums; playing and picnicking at Flinn Springs County Park in inland valley El Cajón; mountain hikes at Flinn Springs, the Laguna Mountains and the El Cajón Mountain Trail; and downtown. There are so many wonderful neighborhoods to visit and places to stroll that it becomes a real want to go outside and play. Here are some images of the many places we found adventure in San Diego County. 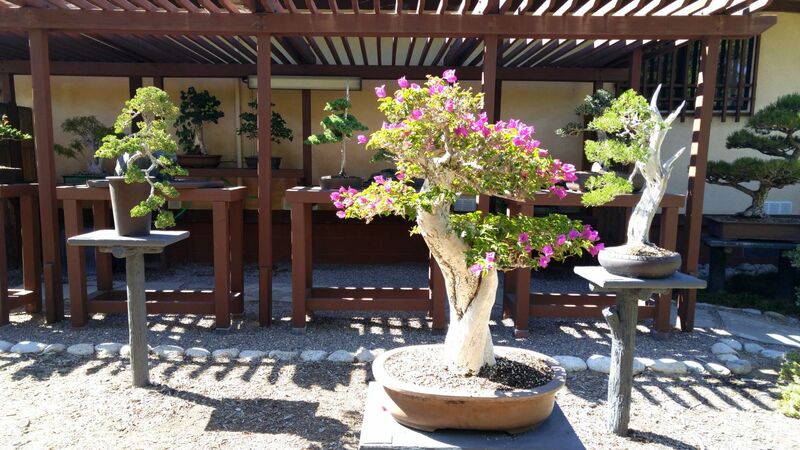 Bonsai trees at the Japanese Friendship Garden. Balboa Park, San Diego. 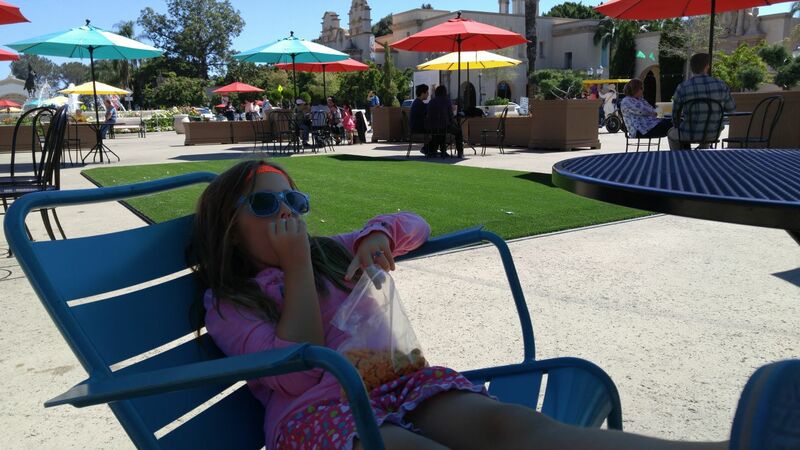 Chillin’ in the shade at Balboa Park. 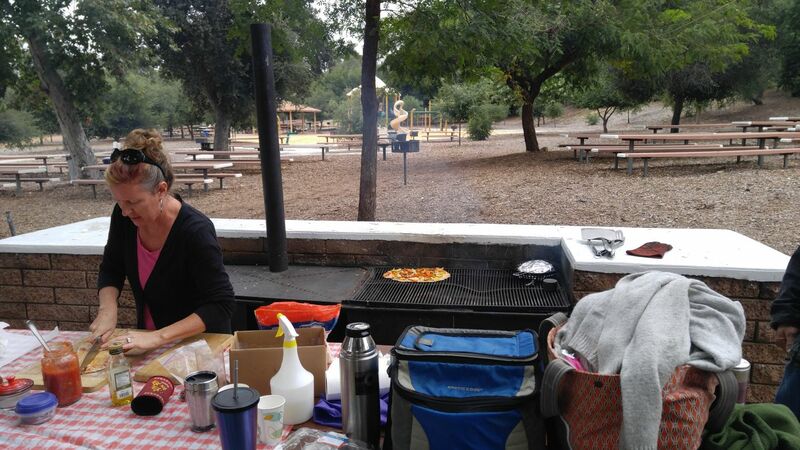 Pizza making and playground at Flinn Springs County Park. El Cajón, CA. 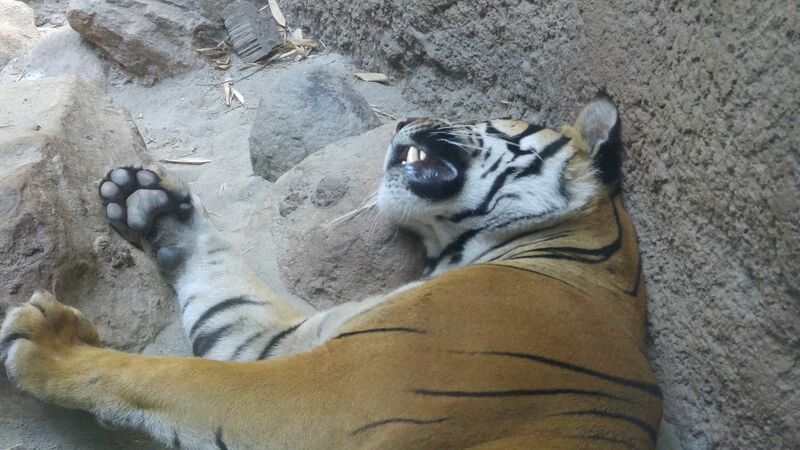 A tiger snoozes at the San Diego Zoo. Balboa Park. 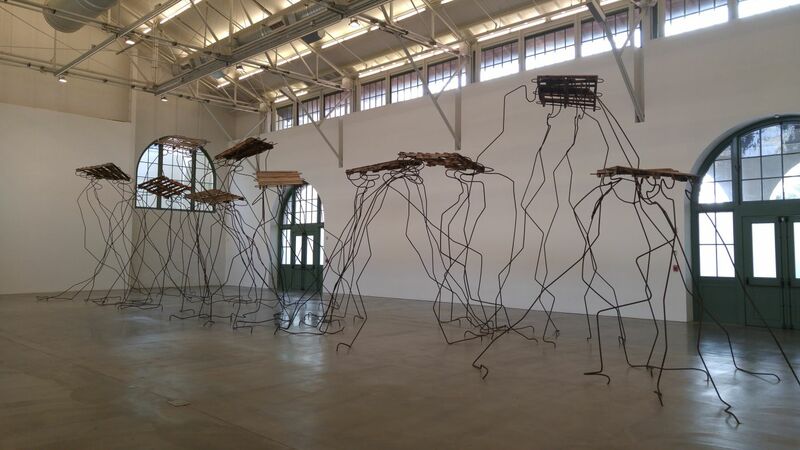 Exhibition of Ruben Ochoa: Watching, Waiting, Commiserating. San Diego Museum of Contemporary Art Downtown. Broadway Park. Gaslamp Quarter, San Diego. Sixth Avenue Playground, Balboa Park. Damn, this traffic jam. To be fair, San Diego traffic never really actually stops. It slows considerably but always maintains movement, even though it is thick with cars because there are so many people in San Diego. 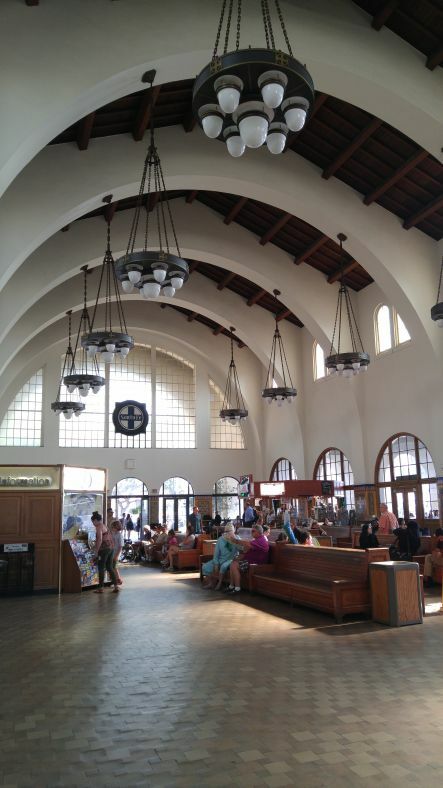 Inside the Santa Fe Depot. The building is still home to Amtrak, and now also the San Diego Museum of Contemporary Ar. Downtown San Diego. The vast and dense population in San Diego was a bit much for us. Although traffic clips along and infrastructure makes almost all of the regions, including downtown, easily accessible, there are a lot of humans and their cars here. 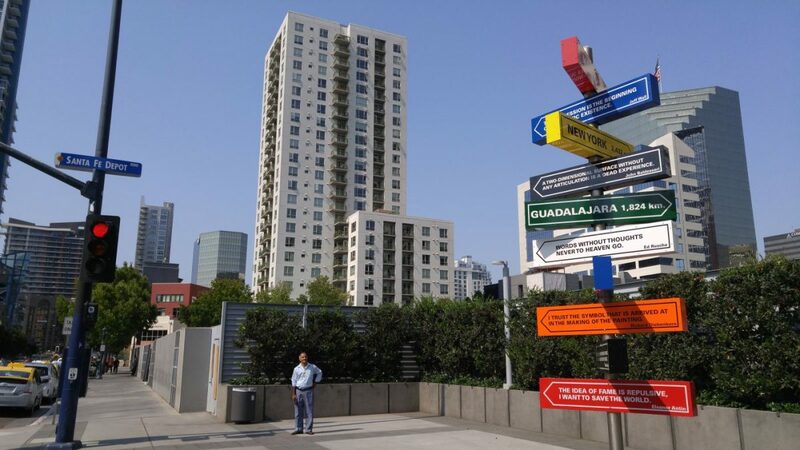 As we stayed in the inland valley suburb of El Cajón — “rural” to most of those we befriended — we commuted often to downtown and various other locations north and south of us. We aren’t super fond of commuting, especially when so much traffic is a concern. There are a few alternatives to cars — the tram and buses, for example — but vehicles rule here, and it could be at times daunting, annoying and excessive. Head to L.A. or the border and you will see Southern California’s pulsing traffic and standstills in peak form. No home for the brave. San Diego also has a unique population issue in the form of homelessness. Besides being the country’s eighth largest city and California’s second, and ranking fifth among the U.S.’s wealthiest cities (Forbes 2005), San Diego has the third largest homeless population in America, with the largest group of homeless veterans anywhere in the country. (In case you didn’t know, San Diego is a major Naval Hub.) In stark contrast to the shiny glass buildings, business suits and cellphones, battleships, crowded neighborhoods and packed restaurants, men and women of all stripes lie on concrete under tarps, next to bus stops, on stoops and behind restaurants to eat or sleep or rest. Pretty parks filled with families, couples and children are interspersed with vagabonds pushing overstuffed carts, snoozing in the grass, talking to themselves or just hanging out together. Tent cities now cluster overpasses above highways. Lots of these men and women have dogs as companions. They all need new shoes and a shower. There are varying degrees of mental wellness. Some accept, even seek, help; others want no help at all. Many travel on bus lines as far as the route will take them for free food or drink, and air conditioning. It is a stunning contrast to this glimmering city by the water and its inland valley homes perched atop mountain peaks. The destitute are painfully obvious here. It is difficult to know how to proceed. The benefit of being in a community teeming with an abundance of homeless folks is that this family was able to see them first hand, and often, and accept it and consider it. Even when we have struggled financially in our personal history, we always have had resources we could ask for help. The U.S. does a lousy job of taking care of its own in many ways; homelessness is evidence of this. It has been an immense life lesson for our seven-year-old to see much of what exists in this world in real time — the haves and the have-nots. Among all of the friends we have made and people we have met along the way, most of them — probably all of them — have options. In San Diego as in other large cities elsewhere, there is a guy asleep on the sidewalk in the middle of downtown as I write this. The destitute are clearly outlined in San Diego. Camping out West is tremendously different than any other part of the country. In the Southwest and in California specifically, folks can live in “campgrounds” — oh, excuse me, “resorts” — all year round, and they do. It is more affordable than living in an apartment or home in San Diego, so resorts are full. No matter if one is a full time resident or transient, in many resorts, all are treated as if he or she is signing a lease on an apartment. There are pages and pages of paperwork, including documentation of licenses, insurances, social security numbers and signing “no crime” agreements. You will pay for electricity along with “rent.” The biggest kicker is that almost all resorts — and I mean almost all — require the entire month’s “rent” upfront. For full time travelers like us, booking several “campgrounds” ahead in Southern California meant thousands of dollars in deposits in just a matter of a few phone calls. The cost is much higher and the rules much more strict the closer one gets to the coast. It was a total drag and forced us to “camp” in the inland valley, high desert suburb of El Cajón. Our spring-summer experience in this rural area was beneficial overall: We made lots of headway in work; Luna met lots of friends, including some new unschooling folks; the pool and the grassy knoll behind the camper made for lots of family playtime; we fell in love with the mountains and Cleveland National Forest; and we honed our values and our future like a swordsmith carves a new blade, making it very sharp. The people we met and the staff at our resort were really wonderful as well; we have lifelong friends now. Oak Creek RV Resort. El Cajón, CA. But it was really challenging on our psyche. It was hot inland all of July and August; we experienced reversed cabin fever as a result. Fire in California is a real and serious threat, so fire pits are generally unavailable, even covered up in public places at the height of fire season. That created a major dent in our SoCal camping experience as it took away ambiance and a cooking source. Picnic tables may or may not be available, and one is expected to use the outdoor living area — another camping experience — as a carport. We paid for an off site parking spot the entire time we were in the high desert. In the beginning and end of our SoCal journey, we were able to camp in a style more befitting our ideals: We bookmarked our stay at the KOA in Chula Vista for WordCamp San Diego, and, as aforementioned, at Silver Strand State Campground in Coronado. However, the KOA is very expensive and doesn’t allow for month-long stays with children (a property tax thing) and the state campgrounds are booked forever in high season. Cash and lots of planning ahead are required to stay in Southern California like this. Camping per se in San Diego was just okay. 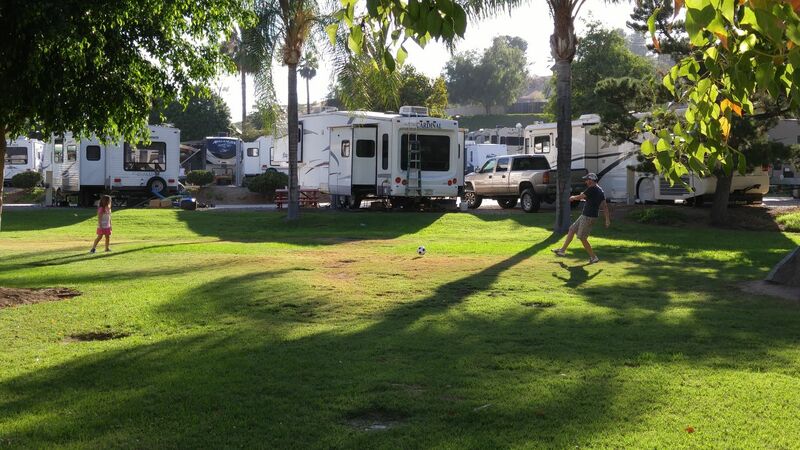 San Diego Metro KOA in Chula Vista, CA. In a few short months as of this writing, we are returning to San Diego for a month because of what we love about it. Because of what we have learned — and what we can now afford now that business is better — we are going back on our terms. We are staying near downtown to play hard before another couple of months of diligent, dedicated work in L.A. We will return with no fruit in the fridge as we cross into California (inside joke); a fire ring and outdoor grill in tow; perhaps a new truck and a full tank of gas that we will hardly use because we will be downtown and, thus, shorten our commute; a renewed KOA membership; a little more cash in our pocket and in cooler weather with a jonesin’ to continue on the next leg of this journey. Overall, we love San Diego, but we don’t want to live there. We hope that San Diego can set an excellent example of how to dissolve homelessness. We hope to find more “campgrounds” that suit our tastes and not have to succumb to resort lifestyle; it’s really not our thing. We look forward to walking, not driving and adding to the traffic chaos. I hope to find pockets of San Diego of yore, if just for a moment, if just via a vintage postcard stash of Old San Diego at an antique shop. We look forward to more play and food the next time around, and to make more of San Diego our own. Stay tuned. 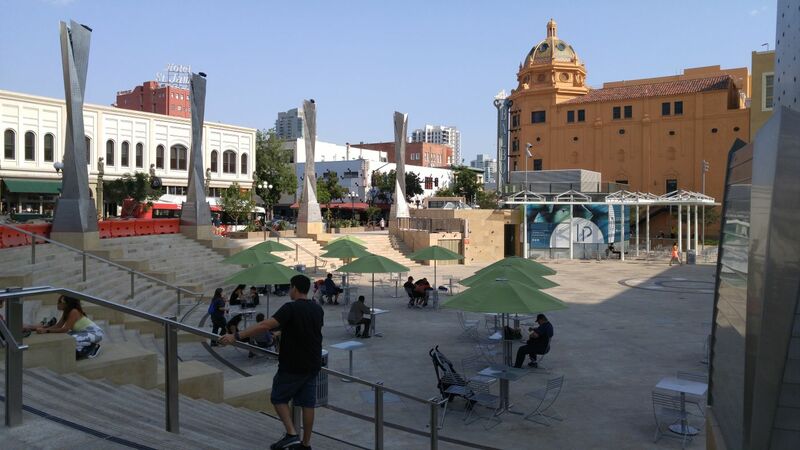 A playground near Gaslamp Quarter/Waterfront. Downtown San Diego. Wonderful writing, I love keeping up with your journey! I would love to see you visit Nova Scotia, Canada from one tip of the province to the other. You need to visit from June to end of Seotember or October! It is sad to read of the homelessness, all of them and particularily the Veterans, considering what they sacrificed for USA! I am so glad that you took the time to read this post. Also, coincidentally, Scot and I were just talking about when we can visit Canada. especially Nova Scotia, Quebec and New Brunswick. We are hoping next fall. That would be so great! We really can’t wait to see it.